Heard about competition? Obviously you have. And, advertisement? What a silly question to ask! Of course, you did. So, may be now it’s time to learn a little bit about ‘competitive advertising’. This is how a dictionary describes the term: “a commonly used type of advertising that communicates the unique benefits of a product, differentiating it from the competition”. So, it’s basically way of communicating how your product is superior from competition. In management jargons: “positioning your product based on the USP or competitive advantage”. Most competitive advertising shows more than one (has to be!) competing products with feature-wise comparison. It is very common for technical products like televisions, mobiles or laptops. Traditionally print media has been the best channel for this kind of advertising as it is easier to show the comparison in tabular form. But other mediums are catching up – we will see this later in the examples section. Competitive advertising can be useful for a new product with clearly better tangible features. Normally direct comparison helps position your brand on technical superiority and functional benefits. It does not work very well for emotional appeals. But of late in this era of emotional positioning brands are successfully using it for all kind of appeals. It makes more sense to use this kind of advertising when you are the challenger; for the market leader – it may dilute your value. And, last but not the least while executing the ad highlight the points where you score higher and hope there is no need to tell to try and hide your weak points. Now, coming to the examples – which (just like you) we believe is the best way to learn any concept. Let’s start with traditional print ads. But hey, we won’t bore you with those tabular comparison tables. 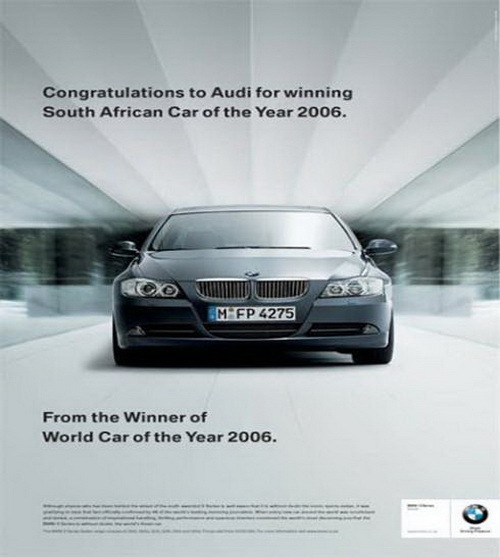 Rather, let’s have a look at some very clever use of ‘competitive advertising’ in the International style. Finally, the Indian brands are no way behind ( in the outdoor format). Who says Indians are not competitive? 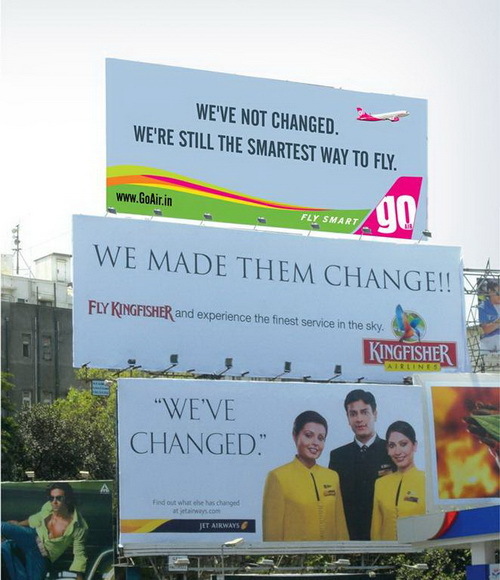 This entry was posted in Featured, Marketing Practice, Marketing Theory and tagged Airlines, Automobiles, Branding, Brands, Brands of India, Cars, Global Brands, Marketing Practice, Others by Dr. Angshu. Bookmark the permalink. Pingback: Competitive Advertising – Creating controversy to get Maximum Eyeballs!! This was so helpful and easy! Do you have any aitrlces on rehab?